Q. Nick, how much thought did you give to who would get the Cup, when did you start thinking about it, and why Dallas Drake? NICKLAS LIDSTROM: I started thinking about it actually in the first round. I didn't tell anyone about it. But I started thinking about if we were to go the whole way, who should be the guy I gave it to first. And looking at all the players on our team, Dallas is one of the first ones I played with. He came in the year after I did. He's been in the League for 16 years. He had a long, good career. And he had never been to the Finals before. So it felt natural to me to give it to him for all the effort and hours and everything he's put into the game, and not having a chance to hoist a Cup yet. Q. What does this mean to you? Is it any different being the captain of the team that wins Is there any different significance to this, how that felt being the first guy to get the Cup? 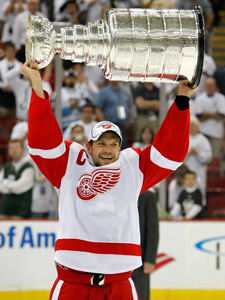 NICKLAS LIDSTROM: It felt great being the first guy to touch the Cup on our team. Otherwise it felt the same as winning the previous ones, where you're so happy with the end result. You start training camp with a goal, and that is to win the Stanley Cup. You talk about it throughout the season and the way you have to play to be able to be successful in the playoffs. And we had a good regular season, and we were able to carry that into the playoffs, too, and so that's something I'm more proud the way the team played in the playoffs, too. It was a tough loss last year against Anaheim in the conference finals, but most of the guys were on that team last year. And this time around, I thought the team really responded well to some of the adversity we faced throughout the run. Q. I know you didn't want to talk about it too much until you got it, but now that you are the first European born captain to lift this trophy, what does that mean to you? NICKLAS LIDSTROM: It's something I'm very proud of. I've been over here for a long time. And I watched Steve Yzerman hoist it for three times in the past, and I'm very proud of being the first European. I'm very proud of being a captain of the Red Wings. So much history with the team and great tradition and we see some of the older players coming through, so I'm very proud to be the captain. And I'm very proud to finally be able to win the Stanley Cup, too. Q. Can you just talk about the effort the Penguins gave you guys tonight and throughout the series? NICKLAS LIDSTROM: They earned the spot to be in the Stanley Cup Finals. We watched them throughout the playoffs. They've been playing real well. And one of the things we said going into facing them, that we have to shut down their offense. Try to eliminate their scoring chances, and cut down on their scoring chances, especially the top two lines that they've had. They've been so good offensively, that if we can play tight defensively, we have to get our chances on the offense end. Tonight I thought was a great example of playing real strong defensively, but we took the play to them, too. We tried to be on the offense more than sitting back and playing defense. And tonight I thought it worked well for us. Q. What does it say that this team in the last 11 seasons under two completely different economic systems has won four Stanley Cups? NICKLAS LIDSTROM: We've proven that under the new system where it's more of an even playing field, that the team has really responded well. We've had the same core group of guys, four, five, six guys for a lot of years. And I think that's been very helpful to keep that core group and add a few players every year. But it shows that we're still able to play well with the new system. And people probably thought we were going to drop off a little bit going into that first season after the lockout, and the team didn't lose a beat. I thought we played well in the first year after that. And I think we've just been getting better and better under Mike Babcock. Our system has been working real well for us. But I think as a team we've really beared down and are playing in the system well. Q. What was it about this team that enabled you to bounce back after losing such a crushing game in Game 5? You had done it in the previous series as well, what was the quality of this team that allowed you to do that? NICKLAS LIDSTROM: I think experience has a lot to do with that. We have some young players, but when you have some players that have been through it before, they know what to expect. And I think that gives the whole team some calmness, too, that we're not going to panic. We're going to go out there and try to play our system and play, stick to our game plan. But the main thing is that we didn't get rattled. I thought we looked a little tentative in Game 5, in that first period in Game 5. You talk about not thinking ahead and kind of put all the distractions away, but it's in the back of your mind, they're still there a little bit. I think that showed in Game 5, in the first period. Once we got going, we played a lot better in that game. But losing that in triple overtime, I thought the team did a good job of putting that behind us. Coming here yesterday on the plane everybody was relaxed. We felt confident as a group. And I felt like that showed in that first period, too, the way we played in the first period tonight.